Age 97, died on June 28, 2018. 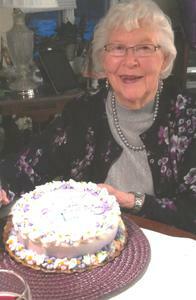 She was born on January 17, 1921 in Watertown, WI the daughter of Alexander and Adala (Thiede) Bramer. Ethel grew up in Wisconsin and served as a nurse in the Navy during WW II and has been a resident of Kalamazoo for more than 70 years. Surviving members of her family include her 2 daughters: Patricia (Patrick) McKerring and Kathleen (David) Sprague; 8 grandchildren: Jason (Angela) McKinley, Shannon (Dave) Rapp, Jennifer (Bryan) Stein, Colleen (John) Bewley, Betsie (Chris) Monico, Matt (Lisa) Sprague, Nicholas Finstad and Amanda Finstad; 17 great grandchildren; Ralph Starz’s 2 daughters: Cathie (Jim) Finstad and Elizabeth Starz. She was preceded in death by her 2 sons: Thomas (surviving wife, Carolyne) and Michael McKinley (surviving wife, Cyndi); and first husband, Thomas McKinley; and second husband, Ralph Starz; sister, Alice Koplien. A Memorial Mass will be held at 10 am on Friday, August 31, 2018 at St. Augustine Cathedral, 542 West Michigan Ave. Burial will be in Mt. Olivet Cemetery. Please visit Ethel’s personal memory page at www.BetzlerFuneralHome.com, where you can archive a favorite memory or photo and sign her online guestbook. Memorial donations may be made to Friendship Village, Hospice Care of Southwest Michigan or St. Augustine Cathedral. Arrangements by Betzler Life Story Funeral Homes, 6080 Stadium Drive; Kalamazoo (269) 375-2900.